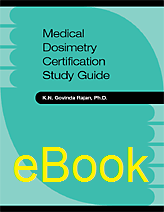 Written by one of the world's foremost experts in dosimetry, this study guide contains nearly 1,100 questions and answers to help in preparation for board certification. The questions have been prepared following the syllabus of the Medical Dosimetrist Certification Board and broadly cover the same subject matter as the Medical Dosimetry Education Program Curriculum Guide published by the American Association of Medical Dosimetrists. They introduce the basic concepts underlying radiation therapy dosimetry and radiation therapy treatment planning and have been carefully written so that students will be able to confidently answer questions in any kind of format that may be found in the board examination. Answers are given at the end of each section and many include explanations with illustrations.